Antonio Banderas has launched King of Seduction, a new fragrance for men. 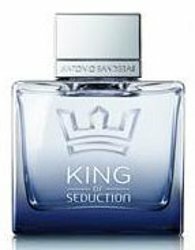 King of Seduction is a follow up to 2007's Blue Seduction for Men, 2009's Seduction in Black, etc. The notes include grapefruit, bergamot, pineapple, melon, green apple, neroli, jasmine, cardamom, marine accord, cedar, vetiver, amber, suede and white musk. Antonio Banderas King of Seduction is available now at Perfumes & Companhia in Portugal, in 50 and 100 ml Eau de Toilette. As I said in earlier posts, I like Antonio Banderas’ perfumes, specially for office wear. Blue Seduction is very wearable. Nevertheless, the names they are choosing (I don’t dare say that “He” is choosing as I don’t know how involved he is by now) are increasingly cheesy! Case in point. Take this bottle. The bottle is lovely. With a simple font and no crown, I’d love this. I guess I am kind of a name snob. I can plead guilty to that. I will try this if course, as Puig has good distribution here in Argentina through drugstores and sample sprays are in every “Farmacity” (our local chain of pharmacy-convenience stores). Please Antonio, can you try doing an upscale line with only numbers as the name, or you can hire someone to do “Weekend at Calabria”, “Vacation at Monaco” or something like that? You’re totally right, of course, but this one is so over-the-top inane that I kind of like it. At least it made me laugh! That would be the perfect flanker!